In order to successfully manage any insect pest, it is important to know where they are, and when. So it’s important to record Qfly infestations in your backyard. An effective way is to hang traps to monitor flies. Traps are available commercially, or you can have a go at making your own. However, be aware that home-made traps, and even some commercial traps, are not highly specific and catch a range of other types of flies. So, make sure you know how to pick the differences between pests and other species. Flies are highly mobile and once they are established in an area, all host trees are susceptible. You may find that some areas of your garden are more conducive to harbouring Qfly, allowing you to concentrate your efforts for best effect. 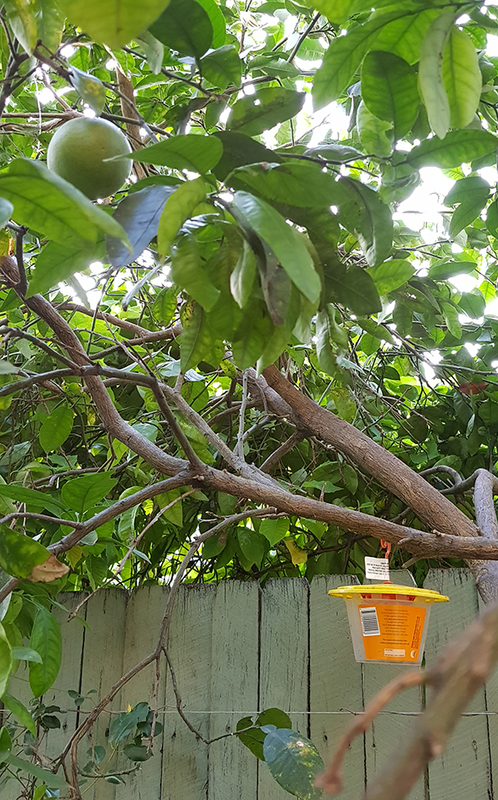 You may even be able to notice when Qfly moves from fruit trees and into garden beds, or vice versa, and target your treatments before they become a big problem. Work with your neighbours to see how flies are behaving across different backyards. This knowledge, shared over a number of years, will help inform you and your neighbours about how this pest might behave in subsequent years, meaning you all can be better prepared.